Genius Extraction Technologies is ramping up and reinventing cannabis extract production. 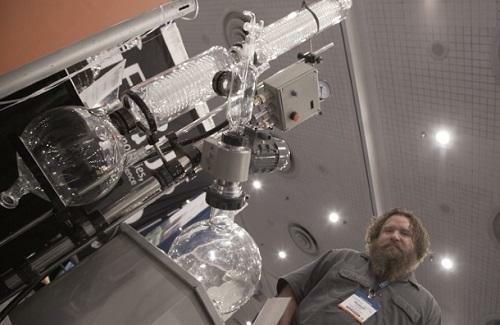 Genius Extraction Technologies and its massive installation of distilling tubes towered over the Cannabis World Congress expo floor. Co-founder Robert Gaither walks us through how the cannabis oil extraction process works, from its negative pressure and temperature system to cooling and filtration, evaporation, and distillation on an enterprise manufacturing scale. Cannabis oil is one of the most versatile THC products, and Gaither explained how at different THC concentration levels, the oil (which he showed off to us in small sample sizes) can be used in absolute extracts, marijuana tinctures, edibles, vaporizer liquid, or even ultra-strong substances like "hempcrete."